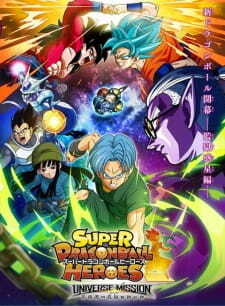 In May 2018, V-Jump announced a promotional anime for Dragon Ball Heroes, a Japanese arcade and trading card game that has never been released in the West. The anime is expected to be short and it is not expected to broadcast on TV. It will adapt the game's Prison Planet Arc, fully detailed in the Heroes manga published in Saikyou Jump, which has never been published in English. The first episode will debut July 1, 2018 at Aeon Lake Town. It's not that I accept this all, of course I would want 20 minute episodes, but we can't change it from a promotional anime to a full-running anime like Dragon Ball used to be by writing hate reviews or being hateful to the makers of this anime. And to the people saying this anime is a waste of time, they also always complain about them being too short, or that it takes too long to publish another episode. If you don't want to wait for the next episode, then do things that are more important like an actual job, instead of writing reviews about hating the series. Besides that I do agree that the story isn't 'interesting' yet, and it lacks logics of the power between characters, but it was already messed up in DBS anyways. This is not to be hating on the haters, but I'm just pointing out some obvious things. This is nothing to anybody personal, but I just see way too many over the top hate reviews on the series. I don't get why so many people got mad and dropped this anime after about 6 episodes. It got way better in episodes 8 and 9. So I will keep watching this even if they are just releasing 1 episode per month I'm still glad we get anything. I mean be more grateful you guys. Just because this review must contain so many letters I'm gonna be a rebel and not continue this review... Instead of that I'm going to keep writing stuff until I'm able to post this review. For what the anime is made for, it works. I did get a bit of excitement to play dbz Budokai Tenkaichi. As it is not a stand alone, it doesn't need to build on the franchise or act like a true anime but it really should have tried though. Hitting fans with too much fan service (fusions) and transformations does irritate though rather than draw a viewer in. I was disappointed with it as it misses a few things that would have made it really great. 1) The speed is off...If you want a fight to have meaning and weight you need more than 40 seconds of a fight. The 15 min episode should have viewer wanting more. This was just too much content with too little development. 2)If the goal is get the viewer amped to play, the battles should be new and epic. eg when I had Budokai Tenkaichi 3 (think it was 3) I enjoyed the epic battles with stacked odds against enemies that had some weight on the story. Although i also enjoyed playing as nova Shenron too that novelty quickly wore off. You know, I gave this anime a chance at first, but after 6 episodes, I've come to realize something: this show is a complete waste of time. Fan-service comes at light-speed and there's no focus on any of it. Characters and power forms fans have been asking for are thrown in for less than 8 minutes and thrown to the way-side the very next episode, and there's no effort put into how any of them would stand up to each other. The baddie saiyan is Jiren all over again. If you've seen Super, you've seen this, only in Super they actually use the 22 minute run-time to generally ease you into the power-scaling. Battles are boring to look at, non of what the show pleases its fans with gets any attention anyways, this is just an anime to promote a shallow Dragon Ball video game, why did I ever even take this anime seriously to begin with?